In today’s fitness landscape such lofty titles probably make one a bit skeptical. Is this just click bait? Let me rest assure you, it’s not! What I wanted to cover was not just an exercise that I love, but I feel is SO important because it does so much more than most people ever think! It is our DVRT Rotational Press! Let down? You shouldn’t be, let me explain. The thing that makes the DVRT Rotational Press so great is not the fact it is a press. It isn’t a shoulder exercise, it isn’t for massive triceps, or anything like that. So, why do I love it so much?!!! For one, it is one of the best measures if people understand rotational training. Remember, rotation is one of the seven primal movement patterns. Along with gait, it is probably the two most misunderstood of the seven. That’s because most people just think rotation refers to turning the body. You see all sorts of exercises on social media where some jumps and turns calling it “rotational training”. That’s not the rotation we are referring to! Imagine if you swung a baseball bat, kicked a soccer ball, threw a punch all by jumping and turning. It would seem ridiculous right? Rotation of the body as we have often discussed is accomplished by pivoting hard through the ground, turning one foot while keep stability with the other. Our bodies are designed for rotation that’s why anything powerful we do typically involves rotation. Where does the DVRT Rotational Press come into play? People can throw medicine balls, use cables, and still NOT accomplish rotation. One of the great things about the DVRT Rotational Press is that if you aren’t rotating properly you will find it almost impossible to do! The drill isn’t turn and press, the goal is to use the ground and the chain reaction up the body to accomplish almost an effortless press. Don’t get me wrong, if you use a super light weight, you can do anything badly and get away with it! I’m talking about ladies using a 40-60 pound Strength Ultimate Sandbag and guys aiming for a 80-100 pound Burly. That load is important because of the feedback it gives to your movement. While most people will say they love the instability of “sandbag training”, ask them what it does for them and you will often get a blank stare in return. 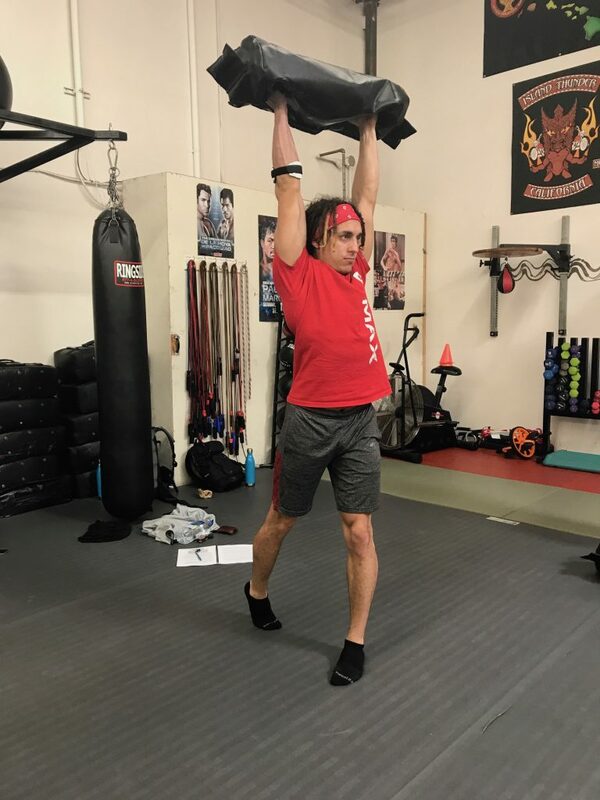 You might get something like, “brah, it makes it like SUPER hard to do stuff!” That may be true but what they are missing is the bigger and actual benefit of the instability of the Ultimate Sandbag…..MOVEMENT ACCURACY! Meaning, if your movement is off, you will get instant feedback because the Ultimate Sandbag will throw you off. That’s why it is important to use real weight here. You wouldn’t say deadlifting 20 pounds did much for me or trying to swing a 18 pound kettlebell either. It is this instability that makes what we do with our DVRT Rotational Presses so different! It is also more shoulder friendly for most people because of the neutral grip, but we will come back to that. Another HUGE benefit of this exercise is that is shows the true purpose of the core. 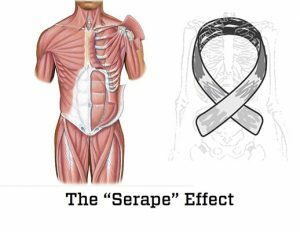 If you are “keeping your plank” as you perform this movement then you will see how the lower and upper body are so closely connected. Lose the plank during the exercise and you will see how disconnected strength makes us so much weaker! The real role of the core is to bridge the upper and lower body! If your DVRT Rotational Press breaks, you will see it happen fast in the weight becomes almost impossible to press! Lastly, it is incredibly metabolic. Whenever we perform many of our DVRT rotational movements with heart rate monitors on people we see them skyrocket. Why? There are just SO many muscles being used in our rotational drills that the output from the body is super high. That is important because imagine if we can teach people to actually move better while we get them in better shape. Often the conditioning program one performs actually goes against the movement training many try to build upon. What if you are having trouble learning the DVRT Rotational Press and all these concepts. That is why I posted recently on my Instagram this great foundational drill. The mini band around the feet gives feedback upon how people should actually use their pivot (which is much harder than it sounds), the pulling apart of the Ultimate Sandbag gives us immediate tension and better control of the lats/core so we don’t lose our plank as easily, finally the super band attached to the Ultimate Core Strap gives us constant feedback to press DOWN and not try to reach as we turn. This is a heck of an exercise in of itself, but it also serves as a great bridge to the probably the best upper body exercise you should be doing. Of course someone will ask if you can use dumbbells or kettlebells. Sure, but it won’t be as good because of the lack of feedback. All the time I see this done incorrectly, but in upcoming posts I will show you when they WOULD be a good tool for your training!